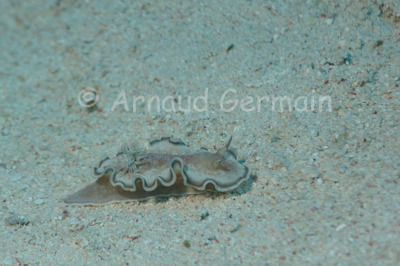 On another critter dive in Marsa Shagra, I came across this nudibranch on the sand. Although quite bland in colours compared with some of its cousins, I spent 5 minutes taking pictures. Its distribution goes from the Pacific ocean to the Red Sea! Thanks to Erwin Koehler for the identification. Nikon D700, Nikon 28-105 mm macro at 98mm, F8, 1/60th, ISO 200, Ikelite Housing and Ikelite DS160 strobe set on TTL +0.3EV. Marsa Shagra South House Reef, about 12 metres down, Marsa Alam, Egypt.